One of Christopher Columbus’s first action upon making land in the Caribbean was to enslave several of the natives. He reported to Spain that the people already living in the Caribbean would make good slaves. This was the beginning of European slavery in the New World. The Spanish, mostly concerned with looting their Caribbean and American lands of gold and silver, learned quickly that the natives did not, in fact, make effective slaves. They perished of European diseases, and often died of simple despair. Europeans put to hard labor in the area did not fare well either. They caught and died of tropical disease, or were unable to survive the hot climate. By 152, the Spanish were importing African slaves. These people came from a similar climate, and fared well in tropical conditions, and also proved resistant to Caribbean diseases. But almost as soon as they arrived, the Africans began to run away from their Spanish masters. The Africans could not go home, and because of their obvious racial differences, they could not blend into any European settlement. Instead, they formed small communities in unsettled areas. Often they intermarried with the beleaguered Natives. The people of these mixed communities were called Maroons, from the Spanish word cimarrón, meaning escaped, feral, or wild. Life was difficult for the refugees. The Spanish had taken the best locations for farming and fishing, and the people of Maroon communities often stated out with little besides their own hands and minds. 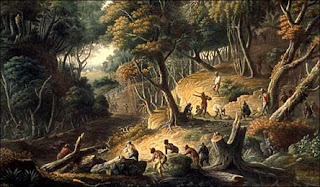 They needed to obtain tools and seeds for farming, home building and hunting. They often did this by raiding Spanish settlements, and soon the Spanish began to fear them. 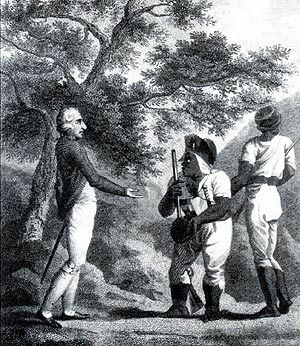 On the smaller island, the Spanish were able to defeat the Maroons, but on larger islands, such as Jamaica, the former slaves were able to form permanent communities in the mountains. From these outposts, they raided plantations, carrying on guerilla warfare. Many of the early leaders of the Maroons are recorded in island history. François Mackandal, a houngan, or voodoo priest, who led a six-year rebellion against the white plantation owners in Haiti that preceded the Haitian Revolution. In Cuba, maroon communities also survived in the mountains, where African refugees who escaped slavery and joined refugee members of the Taínos tribe. Before roads were built into the mountains of Puerto Rico, tough plant growth kept many escaped maroons hidden in the southwestern hills. Escaped Blacks also sought refuge away from the coastal plantations near the city of Ponce. Remnants of these communities remain to this day. Maroon communities emerged in many places in the Caribbean - St. Vincent and Dominica, for example. But nowhere were they more successful than on the island of Jamaica. The island was originally Spanish, but the British captured it in 1655. Originally the Maroon leader Juan de Bolas supported the Spanish, but in 1659 he allied himself with the British and guided their troops on a raid which finally expelled the Spanish in 1660. In return, in 1663, Governor Lyttleton signed the first Maroon treaty granting de Bolas and his people land on the same terms as British settlers. 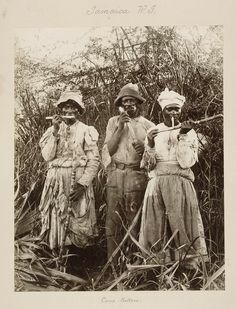 Other groups of Maroons remained independent, living in Jamaica’s mountains and supporting themselves by farming and occasional raids on plantations. Between 1673 and 1690 there were several major slave uprisings, mainly involving newly arrived groups of slaves who had a background of soldiers in Africa. On July 31st 1690, a rebellion of 500 slaves from the Sutton estate in Clarendon Parish led to the formation of Jamaica’s most stable and best organized maroon group. Although many of these rebels were killed, recaptured or surrendered, more than 200, including women and children, remained free after the rebellion. They established an African style government for their group. This group only accepted new members after a strict probationary period. Their most famous leader was named Cudjoe, but it should be noted that Cudjoe is a very common name in the African culture that gave this group of Maroons their origin. Several other Jamaican Maroon leaders had the same name. Another famous – some would say legendary – Maroon leader is the woman know as Nanny, also called Queen Nanny. She is today a folk hero, the only woman listed as one of Jamaica’s National Heroes. Legends say that she was a citizen of a Ghana, Africa, whose entire village was captured in an intertribal war and sold to the Europeans. Other stories say that she came to Jamaica as a free woman. However she arrived, by 1720 she was the leader of a group of Maroons settled in Jamaica’s Blue Mountains. She was a folk healer, a priestess, and the founder of a settlement called Nanny Town. This community was so well located that direct attacks on it by the British Army failed. She was a master of guerilla warfare, and is credited with freeing over 1000 slaves and integrating them into Maroon society. Nanny’s death is recorded in 1733, but in 1739 the British, tired of fighting the maroons, ceded 500 acres to land “to Nanny and her descendants.” This became the location of Nanny Town. Her death is also recorded at various times during the 1760’s. Maroon settlements usually speak Creole languages a mix of European tongues and the original African languages of their members. At other times, the Maroons would adopt variations of local European language as a common tongue, because members of the community spoke a variety of mother tongues. They kept African religions, traditions and holidays. They also kept alive African drumming traditions. Some of the Maroon communities have survived for centuries. Eleven Maroon settlements remain on land given to them in the original treaty with the British. These Maroons still maintain their traditional celebrations and practices. Island tourists are allowed to attend many of these events, while others are held in secret and shrouded in mystery. Singing, dancing, drum-playing and preparation of traditional foods form a central part of most gatherings. In their largest town, Accompong, Maroons still possess a vibrant community of about 600. Tours of the village are offered and a large festival is put on every 6 January to commemorate the signing of the peace treaty with the British. The spanish Catholic Monarchs baned to salve the native americans, not because they were bad workers or weak people!! It was a religious reason: they believe de God guided them to the New World to Make the natives christians ...and y the way to get a los of gold and silver and land for the spanish kingdom. But the american natives were Almost from the beginning their subjets, actually, the few captivated and sent to the peninsula were soon sent back to América. Only if they were rebeles or canibals could be legally enslaved. That is way Spain is going to buy african slaves to Portugal . Great job this blog!! I have read that the Spanish had laws against slavery - but it seems that in practice these laws were often broken or "gotten around." The above poster says that only "rebels" could be enslaved. What did it mean to be a rebel?